A sow bear in Alaska wants me. Local fishing guides call her Nasty Pants. I call her something much worse. Our first encounter was five years ago. 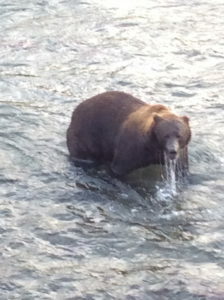 I was minding my own business while fishing for trophy trout at Brooks Falls in the Katmai Wilderness. Nasty Pants came barreling around a large willow stand, huffing and teeth-clacking and making a spectacle of herself. Of course, her spectacle was nothing compared to mine as I splashed through chest-deep water at an all-time high. My wading boots were five sizes too large. 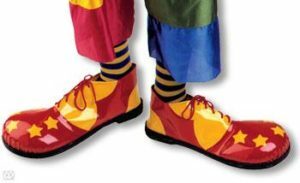 Clown shoes. During our little introduction a 27-inch rainbow took my fly. The line went into the backing as I battled fish and current. Nasty Pants did a territorial-bear dance, marking me as her own. I didn’t know whether to watch the bear, work the fish, or drown. I told the guide to cut the line. “Cut it or I drop your rig,” I said, giving him the Mom Look of Death. He cut the line. I breast-stroked (actually, it was more of a spastic, waving sprint) through the river, then crawled through the mucky wetlands while loudly insulting Nasty Pants’ mother. Then I vowed never to return to Brooks River or Falls. Two weeks ago I returned to . . . wait for it! . . . Brooks River and Falls. My husband, a very adventurous lunatic, was eager to fish it again. I had caught my trophy trout on the Qvichak River so agreed to accompany him. I would bear watch during the morning and read at the lodge that afternoon. He and the guide could do manly things while holding fly rods and running from bears. From a viewing platform I watched watched bears eat and fight and loll. A trio of anglers—silly men—downriver were triangulated by the animals, pinned in place for thirty minutes armed with bear spray and eau du fear. 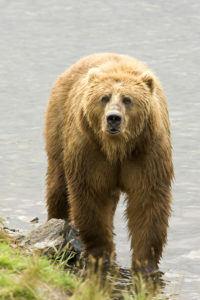 Then a big, ill-tempered blonde bear ambled into view. I looked at her. She looked at me. I recognized her. She thought I was dessert. She wandered around the viewing platform, planning her menu. A group of bears decided that the end of the bridge was a great spot for a nap. 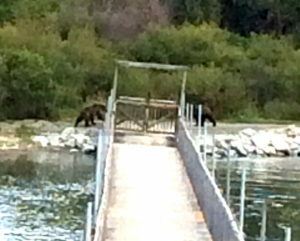 Nasty Pants settled down beneath us, and I pondered my exceptional ability to levitate as the bears blocked the bridge. When they awakened and while Nasty Pants was distracted by a silver salmon, we scooted across the bridge. I glanced over my shoulder several times to ensure that Nast Pants wasn’t faster than me, and then walked faster all the way to the lodge. 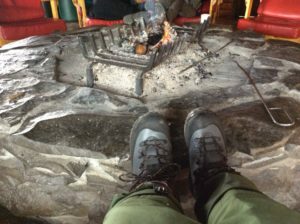 Once at the lodge I pulled out my iPad, propped my wading boots (that fit this time) on the lip of the fire pit, and settled in with a good suspense novel. Every once in a while I’d see a park ranger scurry past outside, rushing toward someone have a bear moment. Happily, it wasn’t me. Just after three, our DeHavilland beaver floatplane lifted off from the smooth surface of Brooks Lake. I know that the big blonde bear standing on the bank was sad to see me go.